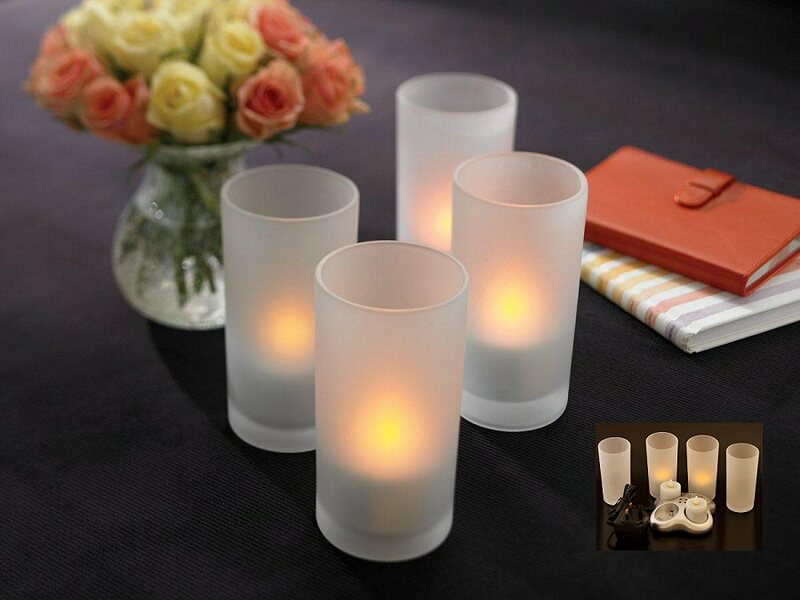 Set of 4 Rechargeable Electric Candles in Frosted Real Glass Ultra-realistic - Use on their own, or to complement real candles! Electric battery-operated LED candles, pack of 4. These electronic candles behave just like real candles. The LED bulbs flicker more realistically than most other flameless candles, and the frosted glasses, in which the candles sit, are simple yet attractive. One of the biggest advantages of these lights is the quality of the flicker. Generally, flickering LED candles have a randomised flickering programme cycle, that repeats itself. Lengthen this cycle (which requires more memory in the electronics), and the candle can be made to be more reaslistic. Our candles contain extra memory to bring you a long cycle of real captured candle flicker, making these candles more realsitic than most others you will find. The second big advantage of this set is that the candles are rechargeable, which saves both the cost and the environmental impact of throw-away batteries. These are among the best flame-free candles that are available, and are built for everyday, casual use, at a very affordable price. These are great fun! Position them around the room and they will instantly create an attractive atmosphere. They can also be used outside for parties or barbecues. All you do is press down on the candle body to switch on and marvel. These candles also work very well in conjunction with real candles - a few real candles on the table, and then the four candles in this set positioned around the room greatly enhances natural candle lighting, without the risk of fire, soot marks or smoke.